Qingyan Ancient Town, one of the most famous historical and cultural towns in Guizhou Province, lies in the southern suburb of Guiyang. As an ancient town, covering an area of 300 hectares (740 acres), Qingyan Town was originally built in 1378. Nowadays, because of its long history and strong cultural atmosphere, the town has become an attractive destination for numerous domestic and foreign tourists. Dating back to the beginning of the Ming Dynasty (1368--1644), Qingyan town was built for military reasons. Because of its geographical location, Zhu Yuanzhang, the first emperor of Ming Dynasty, established it as a station for transferring military messages and to house a standing army. Through years of modification and repeated restoration, Qingyan Ancient Town has gradually become a distinctive ancient town with cultural features of Ming and Qing Dynasties (1644 - 1911). Although small in size, the Qingyan Ancient Town has a well-planned architectural style, hundreds of sites of relics, and an influential local culture. Due to the local geology, Qingyan Ancient Town was built completely of stone. Visitors can see spectacular city walls built right on the cliffs with vast rocks, which divided Qingyan into inner and outer towns. There are four gates in the wall facing north, south, east and west. Outside the four gates, there were originally eight stone tablets, which were considered the symbols of Qingyan Ancient Town. Of the eight, three remain with delicate sculptures on each surface. The most famous one is called Zhao Lunli Baisui (longevity) Fang. Walking inside the inner town, visitors will surely marvel at the ancient architecture here. There are over 30 types including monasteries, temples, cabinets, caves, courtyards and palaces. All of them were delicately designed by the skillful architects of the Ming and Qing Dynasties. A number of exquisite articles, such as the stone sculptures of Ciyun Temple and wooden sculptures of Shoufo Temple are all worth a look. You can visit the ancient business streets to admire the elegant classical wooden houses. If you like, stop at one of those tea houses and have a taste of the famous local snacks, such as Qingyan tofu, rice tofu and rose sugar. Religious culture here is also quite rich, including Buddhism, Taoism, Catholicism and Christianity. If you are interested in Buddhism, you can take this chance to learn the typical Buddhism culture here. Also, you will be impressed by patter of the Taoists. What's more, you will be surprised to find that so many residents here are Catholic and Christian, since the Catholicism was introduced here in 1851 by a French churchman and the Christianity was introduced to Qingyan Ancient Town nearly 70 years ago.While traveling there, visitors will hear many stories of historical figures that were born or lived here. The first Zhuang Yuan (winner of the national examination) of Guizhou Province during the Qing Dynasty was Mr. Zhao Yijiong who was born and brought up in Qingyan Town. Mr. Chang Pinggang, the General Secretary of Dr. Sun Yat-sen was a county fellow of Qingyan Town. Qingyan Ancient Town is really a fantastic place for visitors to learn about Chinese ancient culture. Time permitting, it is worthwhile to stay in Qingyan Ancient Town for one or two days. By doing so, you can grasp a better sense of the classical elegance of this unique ancient town in the early morning. 1. Take bus 203, 210 or Guiyang Airport Shuttle Bus Line 5 to Qingyan. 2. If you take a taxi from downtown Guiyang city to the town, the fare many be CNY80 - 100. There are any hostel/hotels in Qingyan Ancient Town? There are any hostel/hotels in the Ancient Town? I want to sped there 2 nights. How much costs the taxi from Huaihua to the Ancient Town? Yes, many hotels and inns are in the town, such as Shoufu Inn in the East Gat, Guyun Hotel in 64 Neidong Street, and Jixiang Hotel beside Longquan Temple. As for the taxi fare from Huaihua, I’m confused if you refer to Huaihua city, Hunan? If so, taxi is not recommended, since it’s really a long distance. You are suggested to take a bullet train from Huaihua South to Guiyang North first, which takes about 100 minutes and CNY289 for a first class seat, CNY171.5 for a second one. After arrival, you can take a taxi to the town, which takes about CNY90-100. I want to visit qingyan from guiyang, how do i travel? Where do you exactly start in this city? You can take bus no.210 at Hebin Park, and get off at QY Station first. After that, walk south around 0.75 miles to arrive at the ancient town. 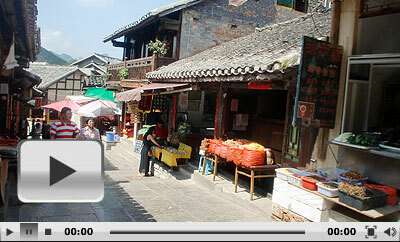 what does the combo ticket of 80yuan include for Qingyan Ancient Town of Guiyang? The combo ticket includes entrance fee to the ancient town streets, the south, north, west and east gates, the ancient town's city wall, the Ciyun Temple, the Temple of the Lord Zhao, the Zhuangyuan's Residence, Longquan Temple, Foshou Temple, the Wenchang Palace, the Wanshou Palace and Foshou Temple. How long would it take to get from Hebingongyuan station using the special line in Qingyan? It takes around an hour. Hi, it is about 30km from the downtown to the ancient town. It takes about an hour by cab and the taxi fare is about CNY100.